What’s in my pumping bag. A well stocked pumping bag is the most essential item you will need when you go back to work. Packing the bag efficiently and with necessities can help eliminate stress and worry while pumping at work. 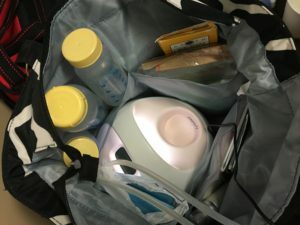 Here are a few of the things in my pumping bag. Obviously the pump is the most important piece. Make sure to check that you have all the pieces and parts in the morning before you leave for work. I had forgotten one or two pieces several times. I actually now keep a spare pump in my car that is always ready to go in the event that I forget something. I always keep instant oatmeal, mothers milk tea, and honey sticks ready for a quick snack on the go. 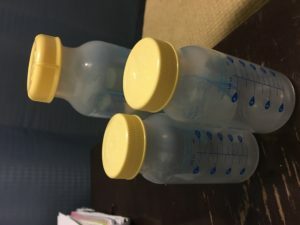 When I know I am going to work the next day, I bring empty bottles to put my milk in. That way I can keep it in the fridge and handy for the next days feedings. If I know I am going to be home the next day, I use disposable milk storage bags. 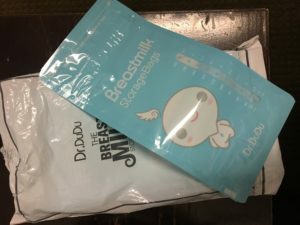 I’ve tried several brands and really like the Dr. DuDu. They’re sturdy and have a double zipper. Plus they come in a handy 8oz size for streamlining in the freezer. I can put my pumped milk in the freezer and it will be ready to go the next time I’m at work. I always keep extra nursing bra pads. I wear washable ones made of bamboo fiber. But you never know when you might need to change them. I keep it small stash of disposable ones in my bag at all times. 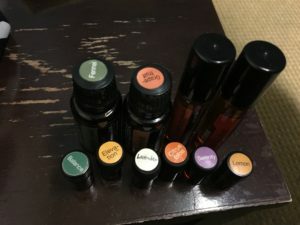 Another necessity is my stash of essential oil’s. I use fennel to help keep my supply up. Serenity, lavender, balance, and citrus bliss help elevate my mood when I’m feeling down at work. What’s in your bag?